True Story is a secret society of anonymous storytellers. In living rooms, attics, and vacant lots, on rooftops and around fires, people are gathering to tell each other stories from their lives. To learn how to become part of our expanding global community, join the party. Recordings from the True Story underground are more raw and revealing than you’ll find anywhere else. Since 2012, we’ve published our best stories on the True Story podcast and on public radio. Find us in the iTunes Store, your favorite podcast app, or the subscribe menu above. We make the True Story Game, a card game that gets friends telling stories from their lives and teaches anyone to be a better storyteller. 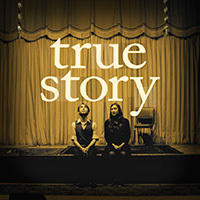 True Story is produced by Will Rogers, Xandra Clark, Daniel Steinbock, and Kevin Townsend. Our music is by Daniel Steinbock, from his album, The Blade. Have a question or some feedback? Drop us a line.